I am always on the lookout for a good art project for the Bean. She is 17 months and still puts a lot of stuff in her mouth so it can be a little tricky to find something that she is interested in and is safe for her. 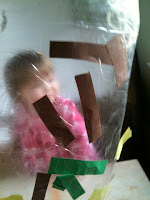 So today for the 30 Days of Hands on Play Challenge to make sticky art I was excited to find a project perfect for her. 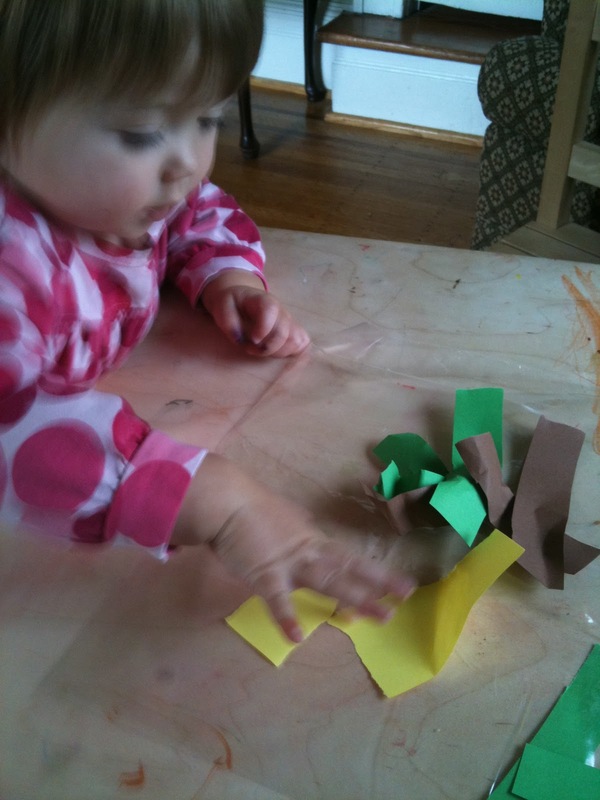 We started by rolling out a sheet of clear contact paper on the table, sticky side up. She kept touching the paper and then pulling her fingers off and looking at them. She was fascinated by the sticky paper. I then gave her a bunch of pieces of cut and torn construction paper. She quickly discovered that if she put them on the contact paper they would stick. Once she was done putting papers on I took another piece of clear contact paper and covered her collage. The final result was a great bean made collage that looks beautiful in the window! Ahhh, just PERFECT for her age! a lovely project. Thanks for sharing via twitter! Huh, this is kind of an awesome idea! I believe I'll be adding it to my list!